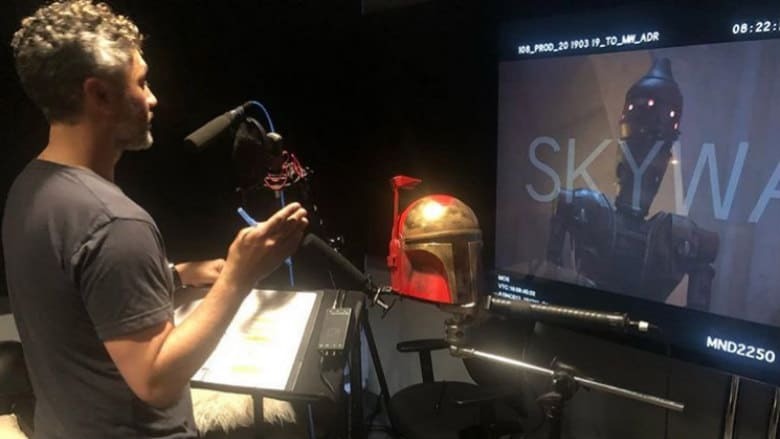 Taika Waititi to Voice Character in The Mandalorian | Nerd Much? Taika Waititi is a busy man. We heard a few months back that the comedian, actor, writer and director would be helming the season finale of Jon Favreau’s live-action Star Wars series, The Mandalorian. But that’s apparently not all that Waititi has been assigned on the project. A recent Instagram post from Favreau seems to reveal that Waititi will be lending his voice to an important droid within the series too. As you can see in Favreau’s image above, Waititi looks to be in the recording studio in the role of a droid character within the show. There’s been speculation as to whether the droid is IG-88, but that’s yet to be confirmed. This wouldn’t be the first time that Waititi would voice a role in something that he’s directing. In Thor: Ragnarok, Waititi did motion capture and voiced the role of Korg. As the polite rock gladiator on Sakaar that would lead the revolution, Korg became a fan favorite. And in late 2017, Kevin Feige went as far as to confirm that the character would be returning in future MCU films. Outside of The Mandalorian, we’ve recently learned that Waititi is also set to direct Apple TV’s adaptation of Time Bandits. But one project that we know he won’t be working on, despite earlier rumors, is Guardians of the Galaxy 3. Other than the tidbits of information such as this, we don’t know a whole lot about The Mandalorian. We’ll likely learn much more when Disney pulls the curtain back on their Disney+ streaming service later this year.